World of Speed, Wilsonville, Ore.
Columbia Roofing & Sheet Metal is tasked with the complete reroof of this car museum. 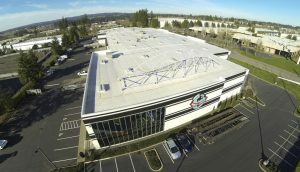 Roofing Contractor: Columbia Roofing & Sheet Metal, Tualatin, Ore.
Columbia Roofing & Sheet Metal was tasked with the complete reroof of this car museum. The crew installed temporary safety anchors for the workers on the roof and yellow markings on the walk pads to provide other trades with clearly marked safe areas. A 60-mil Everguard TPO was installed by five crew members over a full insulation package on the 77,800-square-foot roof. The project features new sheet-metal coping, which was fabricated and installed by two of Columbia Roofing & Sheet Metal’s craftsmen. The crew added skylights to the facility and completed seismic upgrades. The roof system has a 20-year No Dollar Limit Warranty. The roof system has a 20-year No Dollar Limit Warranty but with proper care should last 30 years. The roofing crew also installed a metal canopy over the museum’s entrance. The project was completed on time and within budget.